As a fan of Mr. Bean, maybe I’m a bit biased, but this was one of the most enjoyable films of the summer. Not deep or anything like that, but I rarely laugh this hard in a movie. How often do you get to see a good, funny film free of “naughty” humor and good for the whole family anymore? Mr. Bean’s Holiday delivers. 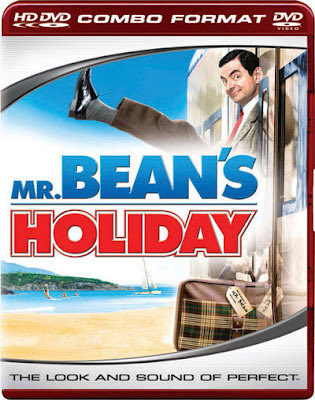 The plot is summed up by the film’s title: Basically, Mr. Bean goes on holiday. Hilarity ensues. Want something a bit more detailed? Ok.
Mr. Bean, the lovable, inept, horribly unlucky and almost-mute goof wins a raffle at his local church, and the prize is a trip to Cannes, France, for a week of fun and relaxation on the beach. To get there, he’ll be taking a series of high-speed trains through Europe, which is the set up for many ingenious bits that pits Mr. Bean’s wits against very simple situations. That’s a dangerous combination, and the relatively mundane task of simply getting from England to France becomes a whole 80-minute movie full of side-splitting laughter. Along the way, Mr. Bean accidentally causes a father to be separated from his son on the same train Bean is traveling on. Now he not only has to get the boy back to his father, but also deal with being a wanted man, as the whole of France thinks he’s kidnapping the boy. He’ll also have to deal with Carson Clay, a filmmaker making his movie in the same places Bean is traveling, and a lovely actress who takes a shine to Bean. There really isn’t much of a plot in the movie, but neither did the TV show. And all the better for it. The movie is simply an 80-minute series of Bean’s hilarious antics. Every few minutes, a new bit starts as Bean travels across Europe. All of these slapstick set-ups are simply genius. Some of the highlights include a scene where Bean chases his bus ticket for miles on a bike, a scene in which Bean and the boy he’s helping to find his father try to raise money by performing lip-syncing to an opera CD, and the brilliant opening to the scene in which Bean can’t understand that his raffle ticket is upside-down. There’s also a great recurring element; Bean’s digital camera, which he films absolutely everything with. Rowan Atkinson is like a modern-day Charlie Chaplin; he’s a brilliant silent actor (if you didn’t know, Bean traditionally stays silent) and the master at physical humor. There are so many great set-ups for scenes in which Bean must fix a problem he created, and does it in the stupidest way possible. It’s very, very funny. Best of all, the filmmakers don’t ever resort to stupid gross humor in these scenes. Atkinson pulls it all off brilliantly. The very small supporting cast is very good too, supplementing Atkinson just as much as they need to. The stand out performance is Willem DeFoe as Carson Clay, an egotistical filmmaker whose movie shoot is constantly being ruined by Bean. To add to the hilarity is a great soundtrack, featuring some fun rock songs and an excellent score that complements Bean’s antics very nicely. There are so many words I can use to describe the hilarity of this movie, but all I really need to say is that if you have any love at all for Mr. Bean, then this movie will knock your socks off. I’ve only seen a couple episodes of the TV show, so my expectations weren’t huge or anything like that when I went to see the movie. But in my wildest dreams I wouldn’t have expected the movie to be this good. It’s no Lawrence of Arabia, but for what the movie is, it succeeds so very well. I should warn you, however, that if you’re only exposure to the character was the 1997 movie, you’ll be taken aback by this one. That movie did not stay true to the TV series, by having a large supporting cast and having Bean talk. While funny in its own way, it was not an accurate representation of the character. Mr. Bean’s Holiday, on the other hand, is much more like the TV series, with Bean being the center of attention and having very little dialogue, beyond grunts and such. Go in with the right expectations, and hopefully you’ll enjoy the movie as much as I did. I would recommend the movie for all ages 6 or 7 and up. There’s no questionable material (it’s rated G) but most of the dialogue (coming from secondary characters) is in French, with subtitles. Kids should have basic reading skills to see the movie. Popping in the HD-DVD, you’ll receive a quick firmware update to your player, and a one minute loading screen. Then you’re treated to the typical Universal Studios HD-DVD menu, which is pretty generic but provides a smooth interface that is wildly easy to navigate. I’ve got to admit, I wasn’t expecting to be totally blown away by the HD-DVD image on this disc. I was surprised the film was actually getting and HD-DVD release at all, but, shockingly, the HD image is spectacular. The colors simply jump off the screen, and the detail is exquisite. The French Countryside, featured heavily, is simply beautiful, and Mr. Bean’s antics are even funnier when it looks so realistic. There are no visible compression issues, and contrast is extremely sharp throughout. Blow by blow, this HD-DVD actually presents a better overall image than the recent Transformers film on the format. There were some compression and contrast issues on that release that are gone from this, which is interesting, considering how much bigger a film Transformers was this summer. Mr. Bean’s Holiday isn’t the best HD image I’ve ever seen, but it represents everything we expect from Hi-Definition and delivers an extraordinarily film-like experience. Bravo. The audio matches nicely with the film. The minimal dialogue is clear whenever needed, as are sound-effects. Music takes center stage most of the movie, and never overpowers the action, but simply enhances it greatly. Some parts got a tad too quiet or loud, but it is a small complaint. Mr. Bean’s Holiday has further validated my purchase of an HD-DVD player. The DVD side is the exact same disc you’ll get if you buy the film in the regular DVD version (about 10 dollars cheaper depending on where you buy) so I’ll give you the info on it incase you don’t have HD yet. After viewing the film in HD, I flipped the disc, and the transition from HD to standard-definition was quite jarring. After re-familiarizing myself with Standard-Def by watching some deleted scenes, I viewed a few key scenes from the movie, and overall, the video quality was quite good for a DVD. Colors and contrast are both sharp, and fine detail is well rendered. There are some small compression issues here and there, but the DVD image shouldn’t disappoint those without HD-DVD. The audio matches the video; it doesn’t have the same clarity as the HD sound does, but it services the image quite well and never overpowers. Either way you go, you should be satisfied with Mr. Bean’s Holiday on home video. The extras are the same on both sides, and are presented in Standard-Definition on the HD side (thus, these extras are identical on the stand-alone DVD edition). First off are about 30 minutes of deleted scenes, which is definitely the best feature on the disc. Many are hilarious, some are dumb. It’s like watching a mini-version of the movie. Sadly, the deleted scenes are non-anamorphic, which is funny, considering every other feature here is in full anamorphic widescreen. The other features are little featurettes with some of the cast and crew that are interesting, but not worth a second glance. Still, the deleted scenes should amuse, and overall, round off the package quite nicely. Bean is definitely an acquired taste, but if you harbor any love for the character, Mr. Bean’s Holiday is a dream come true. The surprisingly good video and audio make this a great HD-DVD disc. Recommended.